BJP supporters, rest easy. Chief minister B.S. Yediyurappa isn’t the only Karnataka politician with two left feet. 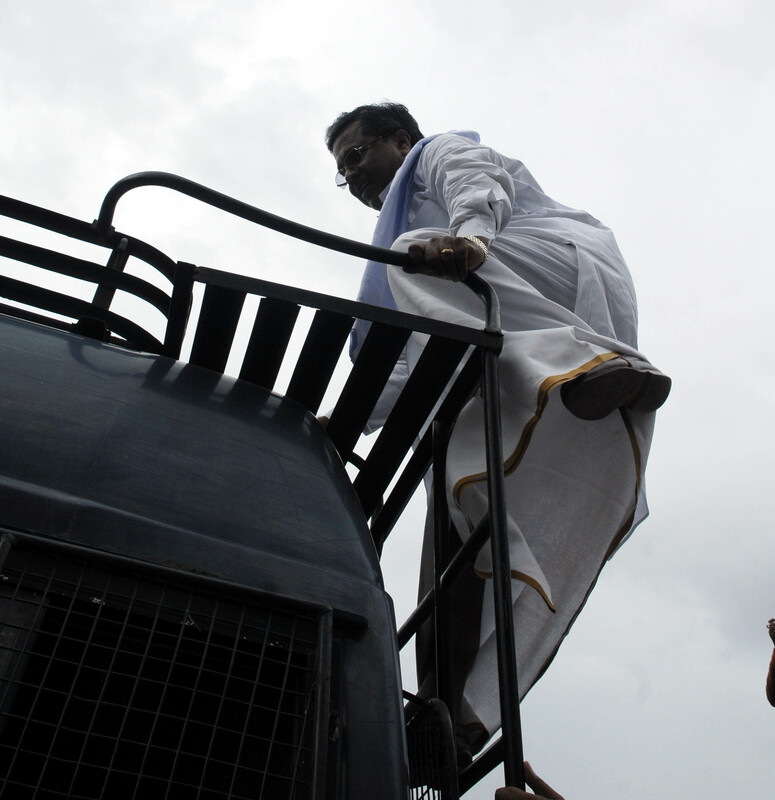 Leader of the opposition, Siddaramaiah, showed on Wednesday that he can match him foot for left foot. At a Congress rally against the BJP government at K.R. Circle, the 62-year-old tripped over his dhoti as he climbed a police van and provided a windfall to photographers. This entry was posted in Kannada & Karnataka, Media, Mysore-Bangalore and tagged B.S.Yeddyurappa, B.S.Yediyurappa, Churumuri, K.R. Circle, Karnataka Photo News, KPN, Sans Serif, Siddaramaiah. Bookmark the permalink. Siddu has fought his way to the top through sheer hard work. He the future CM of Karnataka in the making. Saner of the whole the bunch of Politicians in Karnataka. It’s like stating we have taste IDLI GOWDA, DOSA LINGAYAT, PULIYOGARE BRAHMIN. Now we require a RAGI MUDDE Kuruba to secularise Karnataka. The voice of Tulus,Coorgies,Berry,Konkani is not heard as yet in Karnataka. They need a voice too. “Namma Kayuva Kurubaru…” (No pun intended). How can he climb a Police Van? Is it his father’s property ? or Congress party’s property? Police must have booked him immediately for that monkey act. Anyway anything can happen in India. I think in India freedom is too much. Jai Ho! I think semblance of balance restored. Why didn’t the police arrest Siddha? Agree with Uday Shetty’s comments. >How can he climb a Police Van? Is it his father’s property ? Why can’t he climb a police van? He didn’t damage it!